My name is Josephine Taylor and I am a 15-year-old living with celiac disease. I started my journey almost four years ago after being diagnosed with Hashimoto’s disease and celiac disease. This came with an avalanche of symptoms including swelling, an inability to focus, being tired all the time, headaches and more. I finally decided to see a specialist to get ahold of my symptoms. After finding nodules, I found I had a small chance of thyroid cancer, so my doctors decided on a full thyroidectomy in May 2018. While my surgery was life changing and I feel better each day, this only cured me of my Hashimoto’s and thyroid cancer but not of celiac disease. For teens diagnosed with celiac disease, daily life changes dramatically. It took a while to come to terms with my disease and that this is a lifetime change not temporary. I found some relatives and friends did not understand my limitations with food. Through my journey with celiac, I have realized that there is no availability for hot meals at school due to cross contamination in cafeterias. Prepackaged foods are the only option in most schools and those are usually not meals or healthy choices. Most schools only have cookies or chips that are available to gluten-free students. Schools can not afford prepackaged food or a dedicated kitchen space for celiac students. To go your entire school career and never have a hot lunch can be hard. To not eat a lunch like all of your friends also adds stress to any gluten-free child’s day. I realized there had to be more students like me and it was time to help them. After my thyroidectomy, I decided to do something different and entered a local pageant with the Miss America’s Outstanding Teen, receiving the title Miss Pinal County’s Outstanding Teen. I wanted a change and to do something different. My platform with Miss Arizona has empowered me to talk about celiac disease and other autoimmune diseases with principals, superintendents and legislators across Arizona. I have advocated to school districts throughout the state of Arizona for accommodations like having a dedicated microwave in a nurse’s office for an easy and cost effective way for a student with celiac disease to have a hot meal. While I do have a 504 plan, it does not cover “hot” meals. It is important for students like me to feel comfortable in school and get the same availability as other students. Everyone has been very receptive to the idea of change but without legislation guaranteeing accommodations, but there is still a long way to go. I recently went to the Arizona state capital and spoke to representatives and senators to lobby for microwaves in every school in the state. I got some amazing feedback and am working with a few now to get a rider attached to a bill to guarantee a gluten-free microwave in every school. This solution to accommodate celiac students is not only cost effective but also quick and easy. Schools may be able to apply for grants, fundraise or take out of there budgets. I have recently been in touch with Senator Kyrsten Sinema’s office here in Arizona and am hoping to take this fight to the national level. Parents and teens need to speak with their school nurses and principals to advocate for more change for students with celiac disease. When more parents speak up, the schools will want to help more. I am not alone in my school with celiac, there are several more students who have this disease. The benefit for one becomes the benefit for all of us. I don’t want just a microwave in my school, I want one in every school across America. I am very hopeful that we can make this a national solution to a national problem. There are 3 million people in the U.S. who have celiac disease and hundreds of thousands of them are kids in school. I want future kids to not have to go through the struggles that I am going through and that’s why I am fighting so hard for change. Josephine Taylor is a 15-year-old student living with celiac disease in Tucson, Arizona. 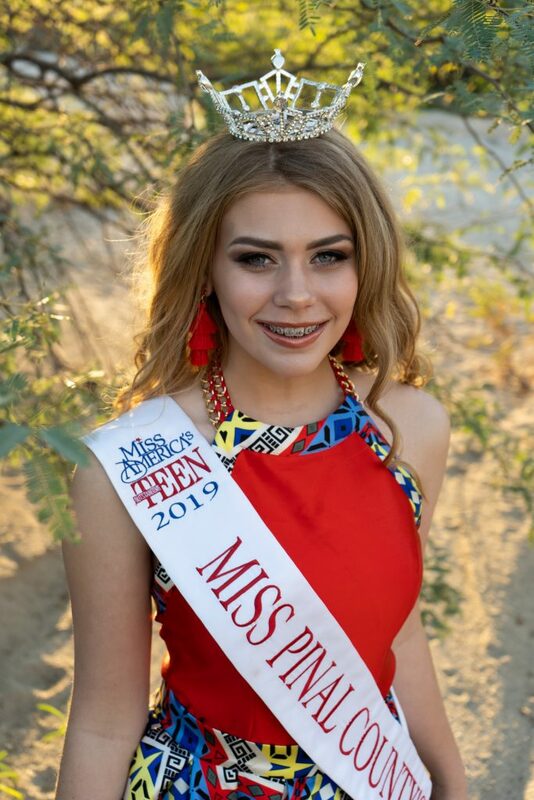 She is Miss Pinal County’s Outstanding Teen 2019 with the platform When Organs Attack: Understanding Autoimmune Diseases. Josephine is competing for the state title of Miss Arizona’s Outstanding Teen in June. When not lobbying for change for students with celiac disease, Josephine is a varsity cheerleader, International Baccalaureate student and fundraiser for CMN hospitals. She has four siblings, a dog named Jovie, and her favorite food is still macaroni and cheese.